If you're like me, you want to have it all. You want to be a stay at home mom, but you also enjoy working and bringing in additional income for your family. Can you have your cake and eat it too? How do I balance the housework, the chores, my toddler, my family, and still manage to have a profitable business? I get questions about time management tips almost daily from the clients in my business mentorship training. Three years ago, when I gave my 9-months notice (it's true!) and left my corner office in the corporate suite, I knew that my goal was to be fully self-employed within the next five years. I wanted to be a stay at home mom and needed flexibility that I just couldn't have as a corporate executive. Fast forward to today, where I am 100% self employed AND have the flexibility to stay home and raise my sweet toddler girl (who coincidentally is napping upstairs while I type this!). Yes, I am busy. But I've also put in place several processes and systems to streamline what I do so that I can be super-productive with my time. 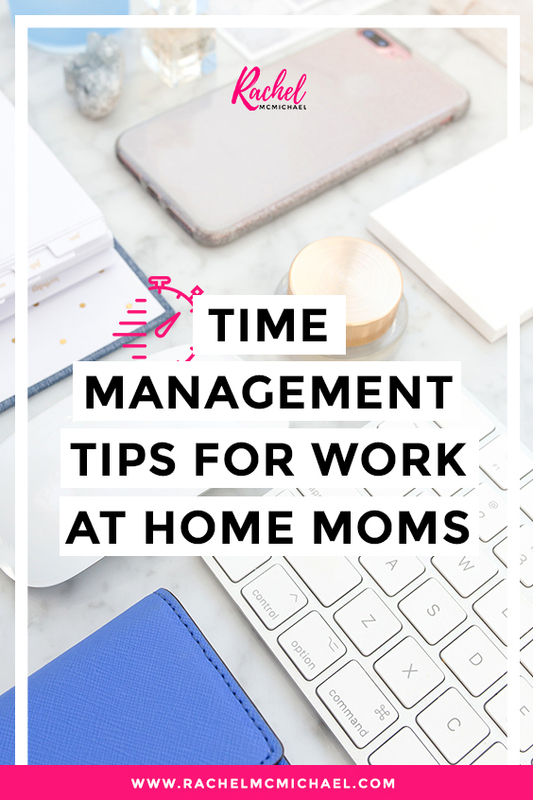 Today, I'm going to share with you some of my top time management tips for work at home moms! Note: This post contains affiliate links (*). For more information, see my disclosures here. The first question I ask anyone who tells me that they don't have enough time is "do you use a planner or calendar"? You'd be surprised at how often the answer is "no"!! My preferred calendar is my Google Calendar. It syncs with my iPhone and with Acuity Scheduling* (which I use for all business appointments). They have a free version and a paid version, and I highly recommend the Pro version. For $10/month, it will sync with your Google Calendar, you can sync it with your PayPal invoicing, and it will track how much time you spend during each type of appointment (a great tool when creating your monthly reports and analytics). The second question I would ask is are you working from a list? Each Saturday, I take time out to brain dump and create my working to-do list for the week. You've probably heard the phrase "if you fail to plan, you plan to fail" and it's true! Successful people work from lists. They have systems in place for everything. Systems and lists save time. They allow our brains to focus on the important things. If you were to walk into a bookstore and pick up any book about success, you would see this tip. Successful people wake up early. And women who want to have successful careers from home do, too. As women, our minds are constantly pulled in different directions - from our children to our husbands to what's for dinner. Waking up early, before the rest of the family, will give you uninterrupted time to focus on the things that will propel your business forward. Working from home, this can be especially difficult. But if we multitask during business hours (doing laundry, cooking, and taking personal calls) then we will also multitask during family hours (responding to emails and on our phone rather than being fully present in our children's lives). Having set business hours and focused time where you work from a specific to-do list filled with activities that are going to propel your business forward will enable you to fully detach when work hours are over. Put your phone in Do Not Disturb Mode (or at least on silent!). Check your email only twice a day. Answer the emails that matter, file them away, and leave the others unread until you have a chance to get to them. Set a timer for 15 minutes any time you venture on social media. It's easy to get sucked into the newsfeed, and all of a sudden you look up and it's been an hour and you're looking at comments on someone's brother-in-law's uncle's page reading a blog post about time management and wondering how you got so derailed. When the timer goes off, stop surfing and get back to work! Get rid of cable TV. You don't need it. I promise! We have an antennae, Netflix, and Amazon Prime, and we rarely watch any of them! Not only are we saving on a completely unnecessary expense, but we spend so much more time as a family - playing, talking, walking, laughing, reading, and just spending time together. If you are struggling with your at-home business, it would be my pleasure to help you! One of the greatest rewards of my job is to see a fellow mom be able to quit her full-time job away from the home and work from home with her kiddos by her side. I'd love to hear from you! What are some of your favorite Time Management Tips?